What happened to the Dogs who traveled on the Titanic? According to the present sample , Joseph Edgette, the size was the that helps save them and were released by their owners without any problem in life rafts. It is emphasized that race 2 were Pomeraniano, one of them, Lady, safeguarded by his master in a blanket and passing it through a baby so that no member of the crew knew it, and that really was like a baby and I think the life of all beings is valuable. 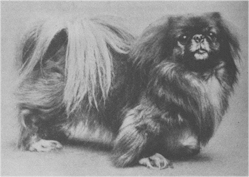 Mention is also saved another dog, which was a Pekingese named Sun Yat-sen, who belonged to the family publishing firm Harper of New York, Harper & Row. Edgette that passenger manifest of the Titanic, only the first class had the privilege of carrying pets on board. Moreover, the occupants had the luxury of taking insurance for their animals, which were not finally paid. "The crew was very friendly and first class passengers were given what they wanted to keep them happy," he added. The saddest story is one of the passengers by the name Ann Elizabeth Isham, 50, in the midst of tragedy escaped in a boat with his dog, a Great Dane, whose size could not be saved. Days after the wreck, witnesses indicated that they found the body of the passenger clinging to his dog, both dead, and we are confident that together will continue in heaven.